When it comes to bed bug treatments, numerous myths abound. If you are reading this guide, it is quite likely that you are currently battling a bed bug infestation. These small, oval-shaped, brownish-red colored insects are a nuisance mainly because of the fact that they thrive on the blood of the animals and/or humans in which they come in contact. The female bed bugs have the ability to lay hundreds of eggs throughout their lifetime. Even worse, these insects are capable of entering your home, undetected. As they mature, they hide in the tiniest most inconspicuous places, such as mattresses, furniture, closets, and similar locations. By the time that you realize you have an infestation, your home could be – literally – covered in these pests. Many attempt to eliminate bed bugs on their own; however, there are so many treatment myths floating around that most do not achieve success. In this guide, you will be introduced to a few of the top myths associated with DIY bed bug treatments and will be provided with the top-rated solution to eliminate the bed bugs in your home, once and for all! The very first and most common myth that abounds is that over-the-counter bug bombs have the ability to kill bed bugs. While these products do contain pyrethrin, bed bugs will run when the pesticide within the canister is released. In most instances, the insects will flee towards the deepest crevices of the home. Furthermore, a bed bug treatment must be able to reach those areas where the insects are known to hide. Examples include inside mattresses, behind the molding in your home, and inside of the electrical box. A bug bomb will not reach these areas. Not only are these treatments expensive and complicated, they are considered to be completely ineffective towards eliminating bed bug infestations. Many mistakenly believe that they must throw away their mattress and box springs in order to eliminate a bed bug infestation. While it is true that this could eliminate some of the bed bugs that are residing in the home, if an infestation is present, the bugs will be present in all areas of the home. The best measure, as it relates to your bedding, is to use a mattress encasement in order to control the infestation. This type of encasement acts as a type of barrier. 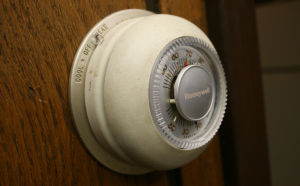 According to numerous studies, heat is an effective measure in eliminating a bed bug infestation; however, in order for this treatment to work, all areas of the home must remain heated at a temperature of 120°F for over an hour. Additionally, all surfaces must be heated in an even manner. This is not possible using the heat in your home, alone.